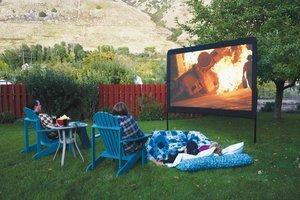 Enjoy Movie night out with a 150 inch Movie Screen. Movies projected in HD, with detached single speaker system, Popcorn Machine comes w/40 servings. The electrical equipment in this package must be stored indoors overnight for protection from the weather.